The worry that the U. S. Government is stockpiling large amounts of vaccines and other medical supplies and contributing to a shortage of important drugs is included on the Sprat list, but is his concern justified? 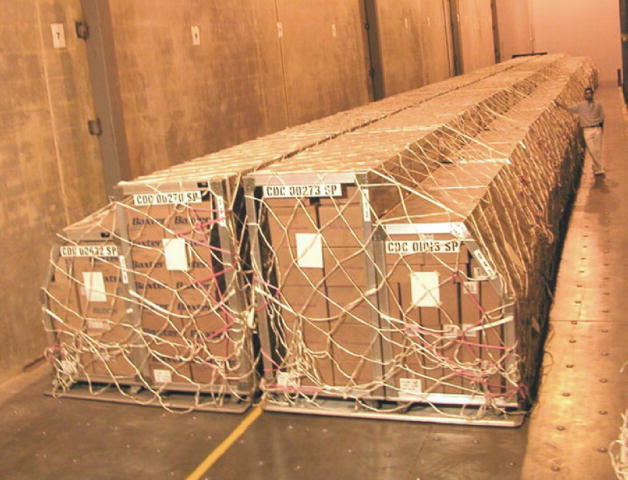 It has been no secret that agencies like the Centers for Disease Control and Prevention and the Department of Health and Human Services have constantly maintained a stockpile of medicines and supplies for distribution in the event of natural disasters, epidemics, and terrorist attacks like 9-11. The Strategic National Stockpile includes everything from antibiotics to human plasma. The U. S. military also maintains a constant call for medical supplies, especially during times of war and with so many troops stationed in foreign lands where the troops have constant exposure to diseases, insect bites and other medical issues uncommon on the home front. There has been an increasing problem of drug shortages, but this has largely been caused by decisions by pharmaceutical companies to reduce production, especially of low-profit drugs, especially the generic brands that insurance companies force consumers to buy. Also a large number of drugs have been subjected to supply interruptions by the manufacturers, especially when the production involves a complex and costly process. As with the issue of food, the shortages in certain drugs has opened the door for middlemen, or commodity speculators that get involved in either marking up prices based upon demand, or even dumping fraudulent drugs into the supply chain. Thus Americans are not only facing supply shortages of certain badly needed drugs for specialized treatment, but often are sold fake pills that offer no medical benefit. While the Food and Drug Administration has the authority to interrupt drug production if it decides the manufacturer is failing to produce a quality product, the FDA lacks the authority to force a pharmaceutical company to continue production of a drug if that company decides to cease production. This happens when the drug is no longer considered profitable. It is all about money. To hell with the health needs of the consumers. To deal with the problem of planned and unplanned disruptions in the production of drugs, some government agencies have proposed intervention through additional stockpiling of these drugs to create a counterbalance on the open market. The idea is for the government to pay more than the going market rate for the drugs then keep an adequate supply in reserve to dump on the open market when shortages occur. As far as we know, this plan has not been put into effect as of the time of this report. The bottom line to the issue of drug shortages is that the problem has not been created by the government. It involves profit motives by both the insurance carriers and the pharmaceutical companies that are in conflict. The insurance companies force patients to buy only generic brand drugs to keep costs down, while pharmaceutical companies appear to be reducing production of the generic drugs to force prices up.